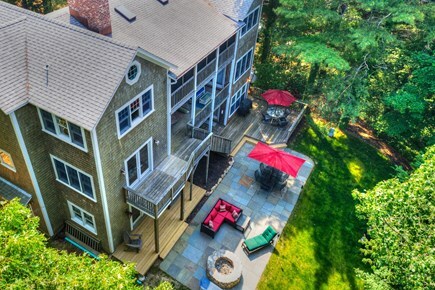 Planning a large group getaway to Martha's Vineyard? The modern and spacious Casa de Reyna has a plush entertainment room, gorgeous outdoor spaces, and an ideal location for beach-goers, cyclists, and foodies alike. 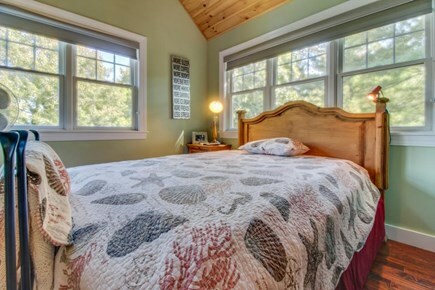 Conveniently located only one mile from downtown Edgartown, this elegant three-bedroom home still feels private and secluded, thanks to its scenic position in a thicket of pine trees. Relax on the recently updated patio and breathe in the fresh air! Once inside, friends and family will flock to the well-appointed entertainment room after long days of surfing and sunbathing. Overstuffed furniture, a flatscreen cable TV, Blu-ray and DVD players, and a film library make movie nights relaxing and easy, while a wet bar and poker table entertains after the kids have gone to sleep. 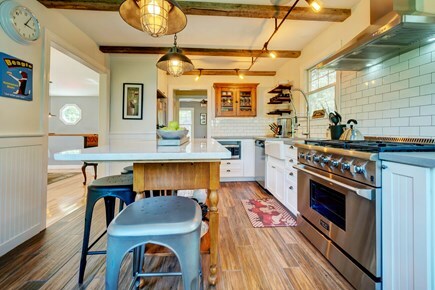 The large farmer's kitchen, complete with a dishwasher, has everything you and your guests will need to cook breakfasts, lunches, and dinners together. There is an eat-in dining area for four, as well as a large open dining room. Just outside the glass doors, an enclosed deck features a third dining space, while three other outdoor decks provide guests with cushioned seating, lovely views of the forest and fire pit, and even a large hammock. Indoors, you can stay entertained with cards at the poker table, or by working up a sweat on the exercise room's treadmill. At night, as many as eight guests are welcome to sleep at Casa de Reyna. The master bedroom, which opens onto a deck, has a queen bed, a private fireplace, a flatscreen TV, and an en-suite full bathroom. 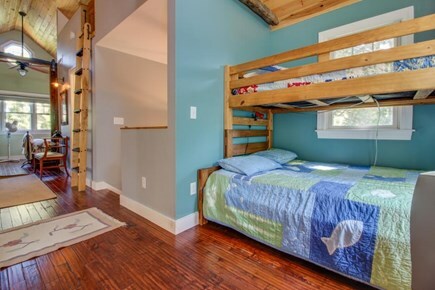 Two additional bedrooms have queen and full beds, another has twin-over-full bunkbeds, and a fifth features a twin daybed with a trundle for the kids. 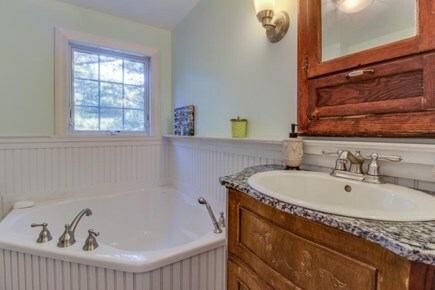 This home has two additional full bathrooms, one of which has a large soaking tub, as well as two half baths. A small loft, central AC, a private washer and dryer, and WiFi only add to the many comforts. 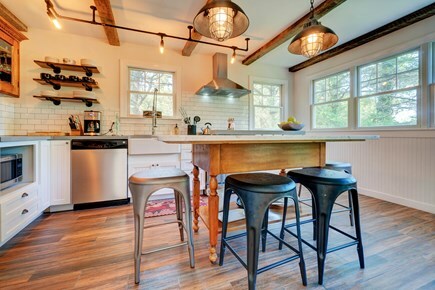 Whether you're looking to hit the beach or stroll through town, this home's Edgartown location puts the best restaurants, shops, and landscapes in Martha's Vineyard within easy reach. Fuller Street Beach is two miles east, while secluded and beautiful East Beach on Chappaquiddick Island is only a bike rental and a ferry ride away. 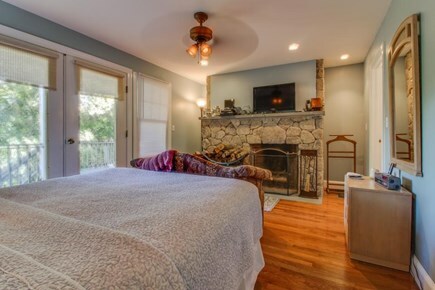 Don't miss out on the modern amenities, outdoor comforts, and ideal location of this home. 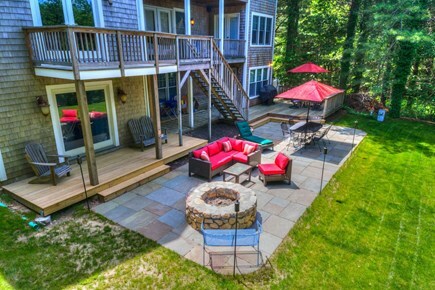 Book your vacation to Martha's Vineyard today! *This is a seasonal rental, only available during the summer. 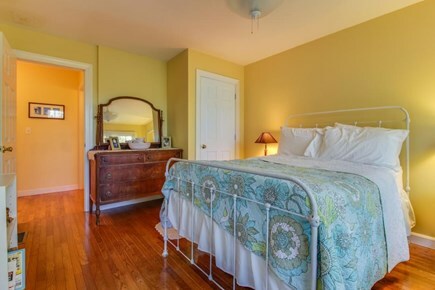 **This house also has the benefit of having a caretaker living on the property to address any concerns during your stay. Additional availability info: Minimum nightly stays might be higher for select holiday dates. Lovely, big home, great for large groups. My mother and I stayed there for a week in 2017 during tropical storm Jose and had a great time despite the bad weather. The outdoor fire pit was our favorite part of the house. Caretaker was very quiet and stayed out of the way. We enjoyed our stay in this beautiful home. 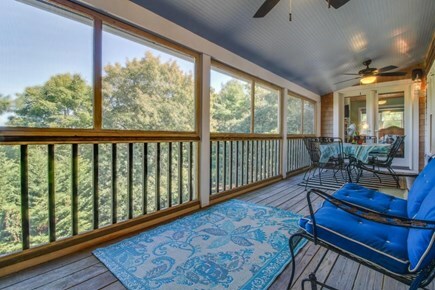 Great porches for relaxing and close enough to town to walk. The house was amazing, the location and everything in it. The vacasa staff was great, very helpful. It was our first time and we love it!! We 'll for sure be back. Great house with a lot of room. The house has a fresh coat of paint everywhere and housekeeping does a good job giving the house a clean and fresh look. 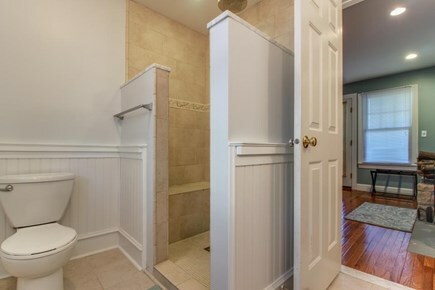 The bathrooms were all updated and clean. We found the kitchen to be a little underwhelming. Not a bid deal because we ate out every meal except for pancakes one day. A sign in the kitchen read "Keep the Kitchen Clean, Eat Out." That may be your best strategy for this house. Lots of outdoor furniture that we enjoyed! Once you acquaint yourself with the layout of the rooms, it is nice to have two distinct 'wings' with the communal dining area. This is not a house for people with difficulties climbing stairs. The house had a lot to offer us! 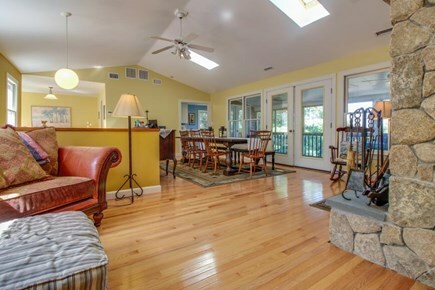 The property is located in a very quiet peaceful area in the woods. The staff a Vacasa were very helpful and accommodating with us to try and get us in the house earlier than the 4 pm check-in. 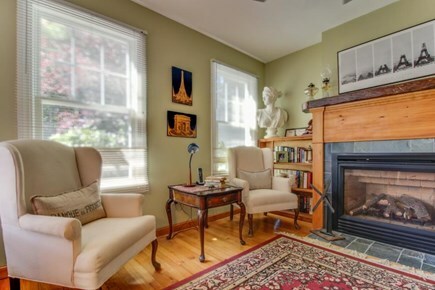 I would not hesitate to use Vacasa again and rent this house. Thank you for a great getaway!